create a project inspired by summer! You have TWO WEEKS to play along - Deadline to enter is Friday, August 5th, 2015 at Midnight CST. The winners will be announced on the NND blog. Post your project to your blog or to an online photo gallery such as Flickr, Pinterest, or splitcoaststampers (on splitcoast please use keywords newtonsnook and IPC34). Several of our Design Team Members decided to play along - check out all the awesome Summer cards they created! Read the description below each card to see who made it. Naki created an awesome beach scene combining two or our Newton summer sets. The kitty in the hammock and tropical drink are from the new Aloha Newton stamp set and the kitty with the sandcastle and pail are from the Newton's Summer Vacation stamp set. 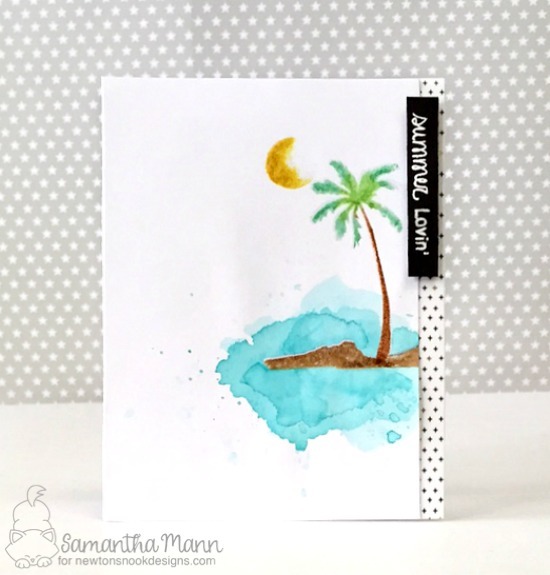 Samantha created an awesome watercolor beach scene on her card. 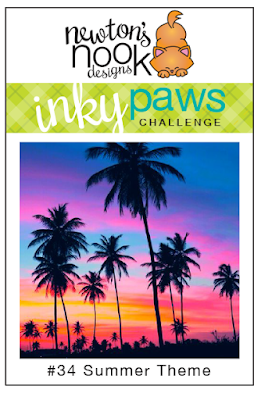 She used distress markers to ink up the palm tree from our Paradise Palms stamp set and watercolored over the top! 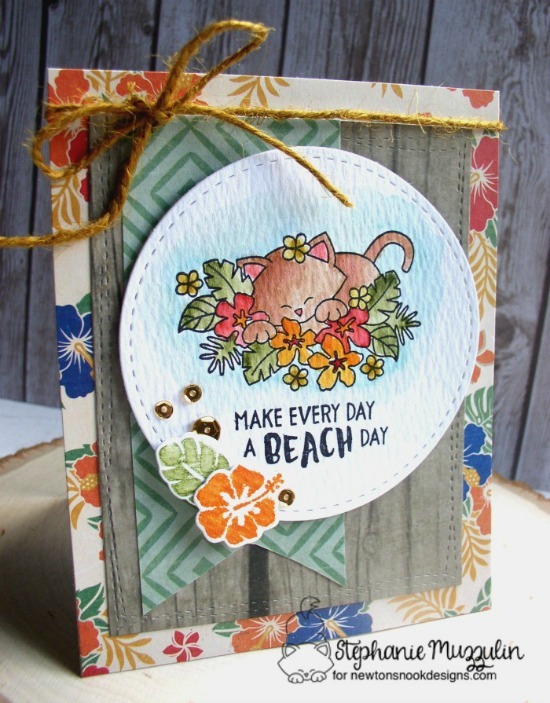 The "summer lovin'" sentiment is from the new Dog Days of Summer Stamp set. 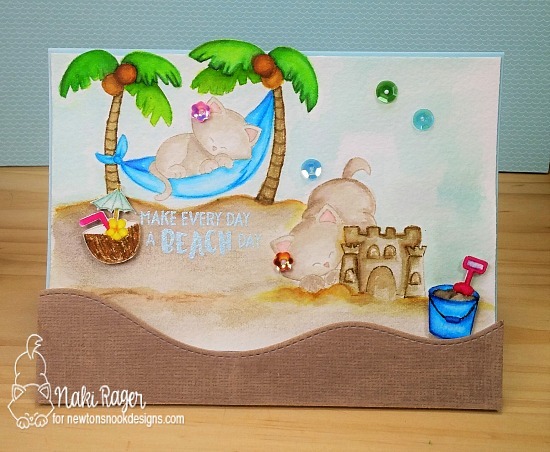 Stephanie created this awesome beach card! She used bright watercolors to color the kitty from the new Aloha Newton stamp set! She also added in the tiny die cut hibiscus and leaf from the Tiki Time stamp set! Such a perfect summery combo! What says summer more than a tiki drink? Jess used a whole crew of tiki faces from our new Tiki Time stamp set across the bottom of her card! I love that pretty sky she put behind them! 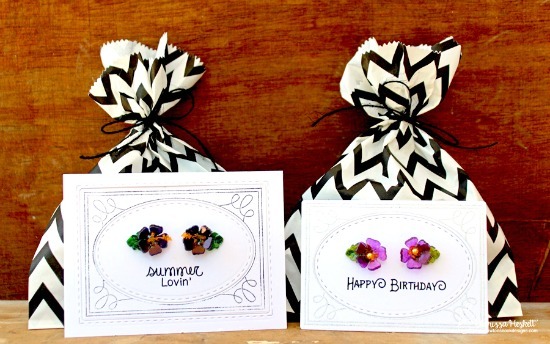 Larissa created some beautiful summer earrings using the Hibiscus die set and shrink plastic! What a fun idea! These turned out amazing! She created those cool backer cards for them using the frame from the Garden Starter stamp set! I had fun playing along this month too! I created a dog card using the pup and ice cream from our new Dog Days of Summer Stamp stamp set. I made a simple card, just adding a sentiment and some washi and flags ups this side using paper scraps! I thought it needed a little bling so I added on a big button!